Running Press Kids, 9780762463855, 240pp. 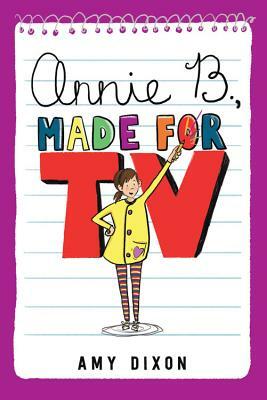 Inspired by As Seen on TV commercials, Annie likes to invent products and write clever sales pitches to go along with them. So when an opportunity arises to audition for a local web show called The Cat's Meow, Annie knows her future is set. She's going to wow those producers with her fabulous writing and made-for-TV announcer voice. Of course, things don't happen quite according to plan, and soon Annie is worried about losing both the opportunity she's been training for her whole life, and her best friend. Amy Dixon is the author of the picture books Marathon Mouse, Sophie's Animal Parade, and Maurice the Unbeastly. She writes from her home in Clovis, California, where she lives on a steady diet of popcorn and coffee. This is her debut middle grade novel.